•	1/4 a cup of sugar. •	1/2 a cup of semolina. •	2 cups of flour. •	2 teaspoons of baking powder. •	Put all the dough ingredients in the mixer and mix it well, then set it aside for 30 minutes. •	Heat tin on a medium heat, then pour the dough like small circles and then leave them to roast (on a one face only from the bottom). 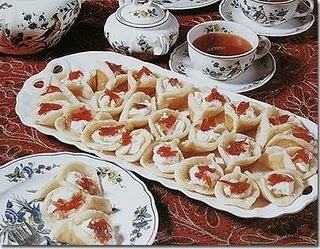 •	Fill kataief pieces with cream and close them by pressing on them and keeping them open from the top. •	Sprinkle them with pistachio and pour honey on them. The stuff: •	Fresh cream or akkawi cheese. 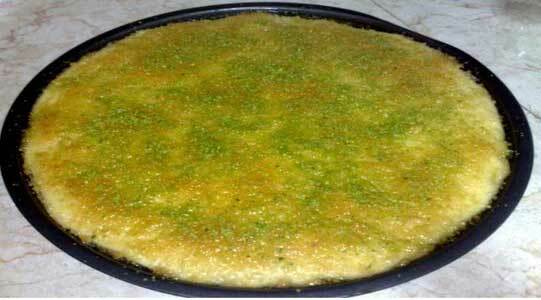 •	Syrup and pistachio for decoration.